If you’re an entrepreneur, are there two aspects of running a business that are so closely related, but so diametrically opposed in satisfaction, than your accounts receivable and your accounts payable? After all, with accounts receivable, it’s people sending you money, and what’s not to like about that? Everyone loves getting money! Whether it’s a minor reimbursement or a significant payment, accounts receivable is the part of accounting everyone likes. Accounts payable on the other hand…well, see above – that’s all about making someone else’s day. And make no mistake, you have to do it. Falling behind on your accounts payable is a great way to trash your company’s reputation. While the two processes may be at the opposite end of the satisfaction spectrum, they are like the intro to Law & Order: “two separate, but equally important groups”. Accounts receivable keeps the money coming to keep business running smoothly, and accounts payable makes sure you’re keeping up your commitments and avoiding letting payments slip that could cause costly penalties later on. A few years ago, a writer for Entrepreneur made a startling discovery: "When I was consulting small businesses on their finances and business plans (now decades ago), I learned, what was to me, an incredible fact: Most businesses are profitable. They actually do generate more sales that are higher than their expenses. However, profitability and cash flow are two very different things. I was, and remain, amazed at how many profitable companies are strangled by negative cash flow." If you sit around waiting for your clients to miss a deadline before contacting them, you’re making a mistake. Accounts receivable isn’t about waiting for late payments and then getting in touch with the client, it’s about making sure payments are made as quickly as possible. Make sure your clients understand when payment is due and remind them at least once or twice as the deadline approaches, as long as it’s not done in a way that alienates them. If the deadline does pass without payment, your team needs to try to collect payment as quickly as possible – the longer the clients drags their feet on payment, the harder it is to collect payment at all. You’re reminding your client to pay, they’re responding and understand the deadline and everything is going smoothly – except your payment process is a mess and the difficulty in collecting payment from your client is more your own fault than theirs. To prevent a scenario like that, you need an internal numbering or invoicing system to make sure nothing falls between the cracks and gets missed, and your entire team needs to be well-versed in how it works. An electronic system like Qount streamlines the entire process and automates much of your accounts receivable to take the guesswork out of it and makes it easy for your clients to stay on top of their billings. It’s a simple truth: incentives work, both on the positive and negative side of the ledger. On the positive side, create incentives for clients to pay their bills. Offer a small discount, no more than 5%, on bills that are paid within a week for instance, on a 30-day billing cycle. While that may cost your business some money in the long run, it does provide a short-term infusion of cash. On the flip side, create penalties when the customer pays late, whether that’s a lump sum penalty fee or adding a fee to their next order. Sometimes, a little prodding can go a long way. Best-in-class technology enables easy tracking and management of multiple invoices from one central platform. Receive and apply payments from your customers in just a few clicks. The easiest and most transparent accounts receivable solution for overcoming your business's cash flow gaps. Our security measures include user authentication and data encryption. Automated invoicing and web-based workflows provide real-time insights into your accounts receivables and cash flow. Export custom reports for insights on improving the efficiency of your invoice-to-cash cycle times. The audit log records your business's complete transaction history. View and manage your outstanding invoices and proactively take action on your accounts receivable. An online self-service invoicing and customer payment portal. Our improved accounts receivable process gains efficiency by use of modern technologies. Most businesses do one or two check runs per month, and we advise something similar, provided you’re staying within deadline for all of your payments. Make sure your accounting staff has invoices lined up and ready to go back to should there be a dispute internally over a particular cost before it’s too late. That also goes for approvals from department heads – should a dispute arise, there will be a paper trail outlining how the decision to proceed with the purchase was made. The monthly/bi-monthly check runs are also a practical matter for the company’s executives – most would rather go through the process of signing checks and viewing invoices once or twice per month than doing it repeatedly throughout a week or a month. Does one of your vendors have particularly onerous late fees or penalties as part of their accounts receivable system? Is there a client you might have been late paying once previously and you want to make sure it doesn’t happen again in order to maintain a healthy relationship? What about vendors who offer discounts for paying early (as we mentioned above)? Whether it’s a function of maximizing cash flow availability for your business or maintaining/strengthening relationships, your staff should be able to recognize situations where certain payments take on an added degree of importance. Qount is the perfect solution for your accounts payable department. By automating many of the tasks and processes it mitigates many issues that can derail your accounts payable system: lost invoices, employee errors, missed deadlines, etc. It also allows for greater analytical review of the system and processes and frees up your people for other tasks. Qount is set up to make the process as seamless as possible for your team in order to ensure that your cash flow remains strong and your vendor relationship stay healthy. 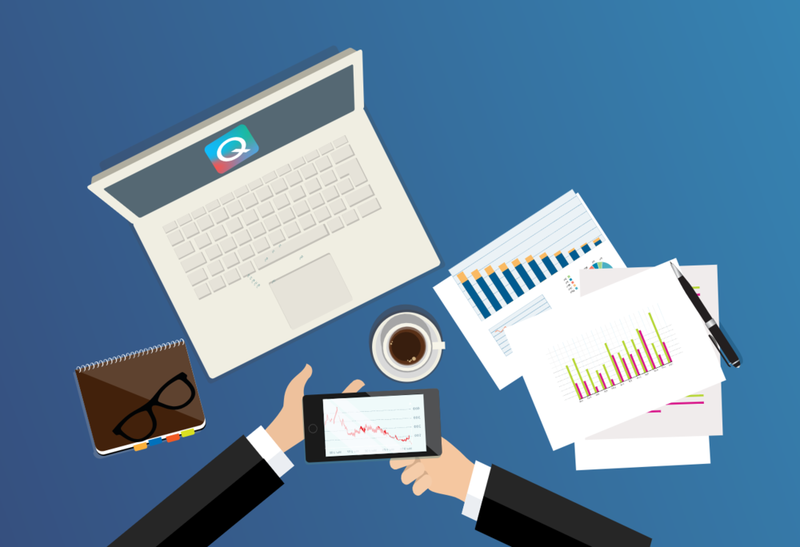 If your business could use a new way of running accounts receivable and accounts payable, Qount’s experts and software are here to revolutionize how your company runs its processes. From just organizing data all the way up to account security, Qount gives you the peace of mind that you’ll get paid on time, while making outgoing payments in such a way to keep your cash flow strong. Contact Qount today to see what we can do for you.